Modular homes can have vaulted and cathedral ceilings. 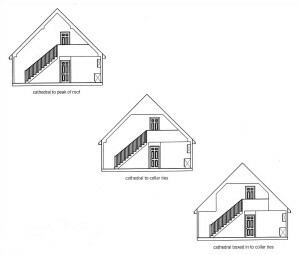 Both are created in part by removing the ceiling of the first floor. 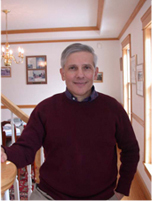 A vaulted ceiling is open from the floor of the first story to the ceiling of the second story. Adding a vaulted foyer to a two-story home, such as in the Whately 1, creates an impressive entry. A vaulted space can also be created above other rooms, such as a dining room or family room. The disadvantage with all vaulted spaces is that it forfeits a potential room above. A vaulted ceiling will create additional work for the general contractor, since he will have more drywall work to do where the modules meet between floors. 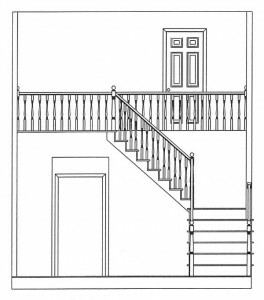 When a vaulted foyer is involved, he will also need to install additional railings for the stairs and the balcony. A more affordable, but less impressive, alternative to a railing is to build a half-wall with a wood cap. A cathedral ceiling is open to the sloped roof above, as is done with the 12-in-12 roof of a chalet-style home. Making a flat ceiling into a cathedral ceiling creates a dramatic room. This feature will cost more than a vaulted foyer because it requires a significantly beefed up structural system to support the roof. It will also cost considerably more for the GC to complete his work, since the ceiling will likely be delivered without any insulation or drywall. Unless the GC completes the entire second floor, he will also need to build a partition that separates the unfinished space from the cathedral space. When the stairs to the second floor enter into the cathedral space, additional railings or a half-wall to the balcony will be needed. Some manufacturers open their cathedral ceilings all the way to the peak of the roof, while others take them only part way, usually to where the slope flattens out at the collar ties that join the two sides of the roof. A cathedral ceiling to the peak is more striking, but also requires more finish work by the GC. If you prefer one or the other, make sure the dealer understands this. 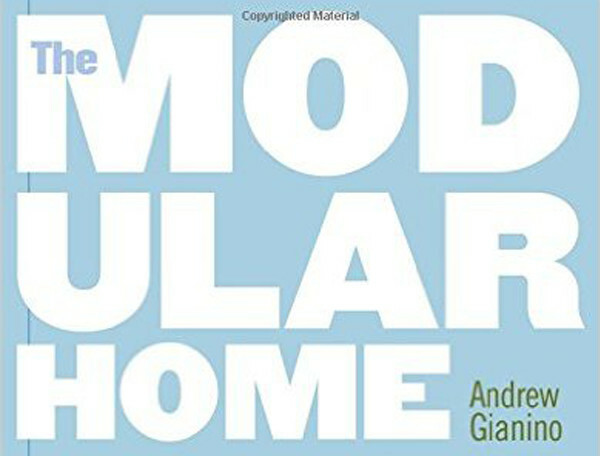 For more information about vaulted and cathedral ceilings, see Designing a Modular Home, Modular Home Specifications and Features, and The General Contractor’s Responsibilities for Building a Modular Home in in my book The Modular Home.